Fastcall is introducing a completely new dashboard. Managers and end users will gain access to valuable information regarding calls, users and call goals. 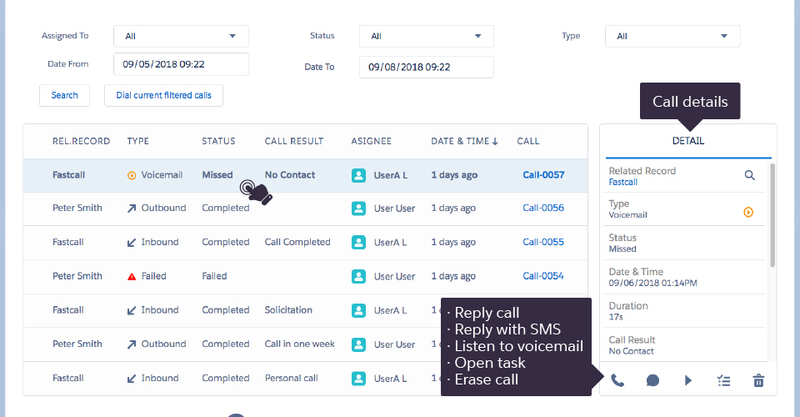 You will be able to inspect the call history of users or groups, in-progress calls as well as missed calls. The new Fastcall dashboard is great for group ACD calls, and a great workspace to manage missed calls. The Fastcall dashboard is a tab found in the Fastcall application, not a settings page in the app. 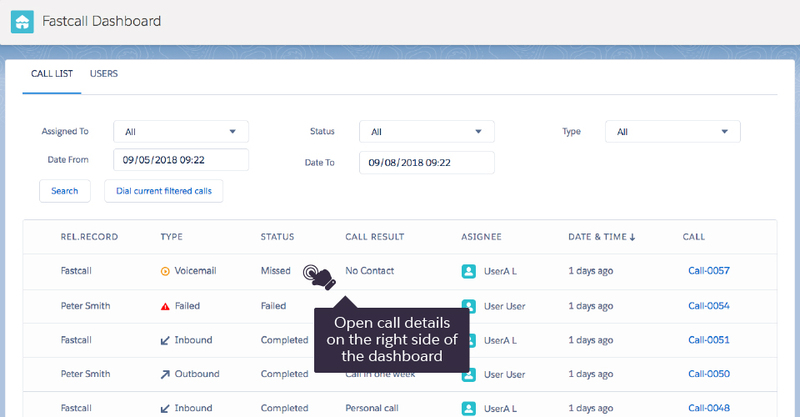 The Fastcall dashboard tab can be added to any application in Salesforce. You will see the Dashboard tab when you install or update the package. Filtering your search with “assigned to” will show calls to users or groups. “Status” filters in progress, completed, failed, missed. Type of call shows inbound and Outbound calls. And finally, you can select a date range. Selecting an item on the list shows the call detail in the right pane in a call navigator. In the right pane “navigator” Fastcall is showing call details in a screen that is similar to your Widget. If you do not have the dashboard tab visible, look for “+” button on Classic mode, or “pen” on Lightning mode, and customize your tabs.